Anti-oxidants are naturally occurring compounds in foods that inhibit inflammation, help slow down the ageing process and help prevent chronic diseases, especially cancer. Anti-oxidants assist the defence mechanisms which enable your body to fight infections and diseases. Another herb, which has been enjoyed as a beverage for more than five thousand years, is green tea. The three types of tea: green, black and oolong, are made from the leaves of the same plant species, Camillia sinensis. However, green tea contains many times more anti-oxidants and health benefits than the other two types. These health benefits are attributed to the content of catechin, which is the active ingredient in green tea. Green tea also contains alkaloids (caffeine and theobromine), tannins, volatile oil and fluoride in some varieties, which reduces the risk of tooth decay. Green tea acts as a stimulant, astringent, anti-oxidant and diuretic. Some varieties reduce blood pressure and cholesterol levels and have anti-tumour properties. Apart from its usual role as a beverage, the damp leaves of green tea can be used as a poultice on insect bites to reduce the itching and inflammation. As a compress, a pad soaked in weak green tea can be a useful first-aid treatment to reduce bleeding from cuts and grazes. Studies have shown that green tea may reduce the risk of urinary incontinence in women over the age of 40 and has lowered the risk of ovarian cancer. In Japan, the drinking of green tea has been associated with a lower risk of death from pneumonia. It has a protective effect on the immune system and increases the proportion of healthy Bifidobacterium species in the colon. Matcha is a finely ground powder of green tea. It contains 100 times more anti-oxidants than regular brewed green tea. The powdering process involved in producing matcha, enables more anti-oxidants to be released than are extracted by the infusion of the leaves. Three weeks before harvest, the young leaves are covered with shadecloth to increase their chlorophyll content, thus imparting the vibrant green colour. Matcha is very high in the potent class of anti-oxidants called “catechins”. These protect the body from the effects of radiation and chemicals which can cause DNA damage. It is a powerful detoxifier, removing harmful metals and chemicals from the body. Catechins have been found to reduce fasting blood sugar levels in Type 2 Diabetes. A cup of matcha tea calms the mind and promotes a state of relaxation by creating α-waves in the brain. It enhances mood and aids in concentration. 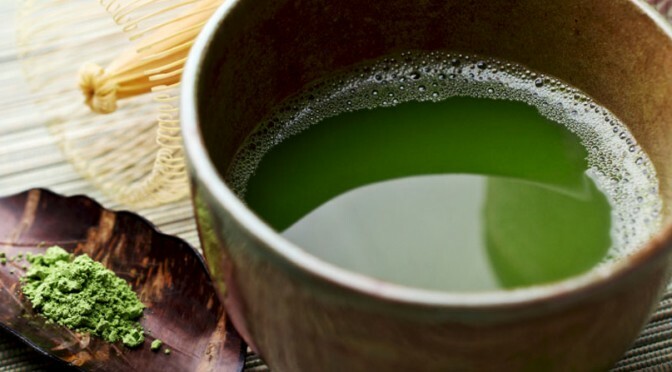 Even though the amount of caffeine in matcha is higher, the anti-oxidants counteract the stimulating effect that the caffeine would otherwise have. 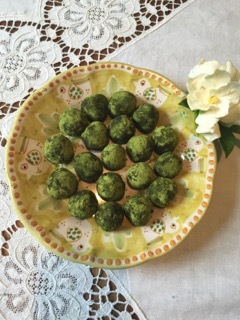 Use half teaspoon in a cup of hot water for a refreshing pick-me-up and enjoy a cup of matcha with these yummy raw matcha truffles! Place all ingredients, except the matcha powder, in a food processor. Whizz till it becomes all sticky. Place in fridge for 20 minutes. Scoop out 1 tspn at a time, and roll into a ball. Then coat in matcha. Makes about 15 balls. For a special occasion, substitute cognac for the vanilla extract. Add an extra splash.